Mr. Tuffy has introduced a new tire liner that weighs 50% less while retaining the same famous level of puncture flat protection as their regular weight liners. First introduced 30 years ago, Mr, Tuffy Tire Liners have been the standard for flat proofing bike tires around the world. "We feel this is the biggest leap in tire liner technology since we first introduced the dual layer concept over ten years ago," claimed Ken Hassen, company president. Mr. Tuffy Ultra-Lite Tire Liners were developed for the avid cyclist who previously felt that the added weight of a regular Mr. Tuffy liner was too high a price to pay for flat-free cycling. "Now at 1/2 the weight (32 grams vs 64 grams for a 700C x 25), we've pretty much solved that problem," says Hassen. These new premium tire liners employ an exclusive fit curve and grooved "tread" design for easier installation and to help keep the liner in place for a smoother ride. Mr. Tuffy is a dual layer tire liner made of unique, lightweight polyurethane compound. When inserted between the bike tire and tube it provides a protective layer between road hazards and the inner tube. Thorns, broken glass and other road debris that may penetrate the tire casing are blocked from puncturing the inner tube. 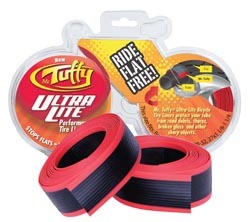 Mr. Tuffy Ultra-Lite Tire Liners and regular Mr. Tuffy tire lIners are sold in sizes to fit all popular bicycle tire sizes and are sold only through independent bicycle retailers.